Tourism is both a blessing and a curse. Islands like Roatan rely heavily on tourism for their economy, and the tourism industry can help push through conservation initiatives to protect natural heritages. However, a big influx of people who are not aware of proper etiquette can do more damage than good. As the world gets smaller, it's important for visitors around the world to practice responsible tourism and leave each place in better condition than when we visited it. You went somewhere because it was beautiful and interesting, so shouldn't others be allowed the same privilege? Let's bring the conversation to Roatan and talk about proper beach and reef etiquette! If you practice a little mindfulness and follow these 3 important rules for proper beach and reef etiquette, you can do your part as a responsible tourist (or resident) to help keep our island amazing! Standing on the reef is a big no-no. Whether you're snorkeling from a boat or from shore, if you get tired and need to take a rest, you should either float on your back to regain your strength or stand on sand. Coral is alive; it's a living, breathing animal, and standing on it can do irreparable damage. If you don't feel comfortable snorkeling without standing on something, wear a life jacket to help you float. You should also avoid walking through turtle grass. A lot of little animals, like nudibranchs, crabs and juvenile fish live in turtle grass, so it's an important ecosystem on Roatan. Keep a healthy distance from coral and turtle grass so that our marine world can continue to thrive. +5 points if you get this Arrested Development reference! Seriously, though, no touching. No touching, grabbing, or collecting marine life. Everything underwater, from a small, empty shell to a piece of grass, can be a home or food for a marine animal, so please don't pick anything up off the beach or take anything out of the water. No matter how small, each life is precious, and deserves to live its life without harassment from us. As a follow-up: be aware of what you are purchasing. Just because you don't physically take it out of the water, purchasing marine souvenirs, such as conch shells, seahorses and coral is all off-limits. Make sure to educate yourself on the illegal wildlife trade and sustainability, because ignorance is not an excuse. 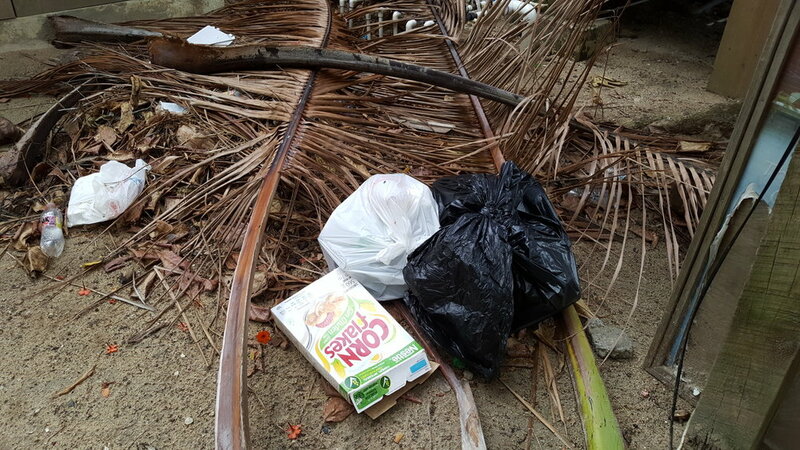 High season, especially times like Semana Santa, normally sees our beaches get littered with plastic bags, takeaway containers and soda bottles. These eventually end up in the ocean, where they can get snagged on or choke turtles and fish, or end up in their stomachs. Avoid using disposable plastics by carrying your own reusable items, and always throw your garbage in the trash if you do end up using disposable plastic. Since we know it can be difficult to go traveling with your own reusable containers, try to frequent restaurants that offer alternatives to plastic. A lot of restaurants offer takeaway containers made from paper, courtesy of the Roatan Marine Park, which have less impact on the environment than plastic does. There are even biodegradable, plant-based options out there, too! Remember, even if you're using plastic alternatives, littering is still not allowed. So there you have it, 3 easy and important rules to follow for proper beach and reef etiquette! Whether you're traveling far away or staying closer to home, practicing responsible tourism will help ensure a better future for the planet. Have a happy summer and hopefully you'll all get to enjoy our little island soon.